Purple Yam known as Dioscorea alata, and many other names, is a species of yam, a tuberous root vegetable, that is bright lavender in color. People sometimes confused this with taro and the Okinawa sweet potato. In my country, the Philippines, Purple yam is known as ube we used this in a variety of desserts, as well as a flavor for ice cream, milk, Swiss rolls, tarts, cookies, cakes, and other pastries. 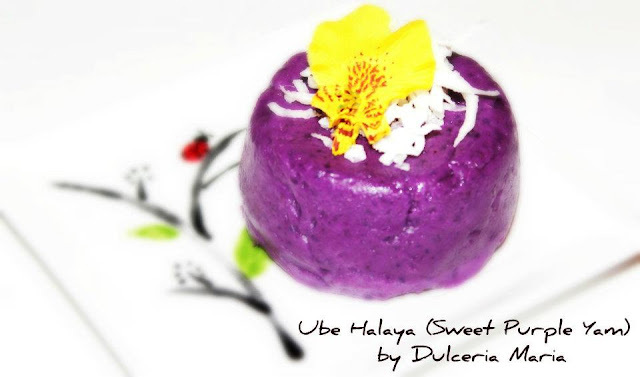 It is eaten as a sweetened jam called ube halayà, which is a popular ingredient in the iced dessert called halo-halo or just eaten by itself. Yes, this is a starch on starch dessert. So if you are on a diet this is not for you. Ube Halaya is a dessert usually serve in the Philippines for special occassions. You'll see this serve at Fiestas, most of the time. One thing about us Filipinos, we'll find any excuse to have a celebration. There's even this ridiculous thing young people do now. MONTHSARY's!!! They celebrate monthly anniversaries since the first day they dated or married, or celebrate their children's birthday every month until the baby turns one. For some who have not tried Ube/purple yam, it will sound weird, unusual, or bizarre. It taste a bit like sweet potato. When made into ice cream it has a similar taste to red bean ice cream but has a smoother consistency. So next time you visit an Asian Market look in the freezer, and see if you can find Ube Ice Cream. Be a wee bit adventurous and try it. In the United States it will be hard to find fresh Purple Yam, you'll mostly find frozen grounded purple yam (labeled UBE) in the freezer aisle of your local Asian markets. Here's my bestfriend's recipe that I can share with you. In a medium size pan preferably non-stick, add and melt butter in medium heat. Add the condensed milk. Blend well. Continue mixing the ingredients for about 20-30 minutes, or until it is a thick and sticky consistency. Add the evaporated milk a little at a time, and continue to stir for another 15 minutes. Let cool. Transfer to a mold or you can just keep it in an airtight plastic container. Make sure you constantly stir, it coagulates and dries easily. I like to put the ube mixture right after it has cooled in the food processor to get a smoother consistency. This looks great! I've seen purple yams sold here in Canada about 2 years ago, but never again. I haven't seen fresh purple yams since I have moved here from California. so I just use the frozen grated purple yam (UBE)from the Asian Market. with all the nominations I'm getting. Oh I just love ube! And thanks for sharing this easy to do ube jalaya ~ I'll bookmark this one and try it out. Thanks for visiting my blog.Have you been to my 2nd blog yet? Glad to have found another Filipino foodie, a Paulinian and Assumptionista at that!!!! So nice to meet you. Let's stay connected. Are we following each other on Twitter? I'm @Mango_Queen so hope to find you, too. Thaanks for stopping by Betty! We definitely should stay in touch. Love the amazing food bloggers I have met here. I will visit you other blog soon. Sounds so interesting! Never cooked this cuisine before OR with yam... Looks delicious! It's a special treat Kelly. If you'd had Sweet potato, it's a bit similar but more decadent. Thanks Ellen. You are so sweet! I actually did nominated you as well. This recipe is pretty easy Joanne. Im sure you can make it without any problem. Hi, Thank you for sharing this recipe. Just what I needed. My Korean friend came over and we reminisced our time together in the Philippines. Then she mentioned ube ice cream as her favorite. Luckily I had all the ingredients listed here and I made halaya for the first time ever today. It's wickedly good! Is the ftozen ube are cooked already? can i use sweet potato as substitue for ube?